After waiting all day Saturday for the super northerly flow to veer into a flyable range, Sunday and Monday delivered breezy, chilly and dry conditions, with the highest cloud bases we've seen in ages. Strong winds didn't stop pilots from scoring many personal cross country bests: it just meant we barely had to turn along the way! Twenty pilots enjoyed a wide spectrum of cross country flights, with nine first timers notching golf course milestones in Kahuku! Kauai Bob had an early window with a plane to catch in the afternoon, so I headed up to join him for a rare morning flight. The air felt strange, like it couldn't decide if it was trying to blow north or east, but I zigzagged my way to Kualoa and back while waiting for it to make up its mind. Meanwhile lots of pilots showed up to join us, and the flow turned more decidedly east, so we set our sights on Kahuku Golf Course. Only a few of us have ever landed there, but this seemed like a day for many to achieve that milestone. After a gorgeous cold photo session above Sacred Falls, I led the way to Kahuku Golf Course, arriving with a comfortable margin, followed by James, Scot and Reaper for their first times. Congrats, guys! Kauai Bob landed at BYU, Berndt at Pounders (I think), McStalker at Laie Point, and Gaza at Malaekahana, just a hair short of the golf course. Thanks to Duck and Colin for the retrieves! Later we drove back out to the golf course to see Thom land there for his first time. Not sure it counts though, because he had such a long head start coming from Makapuu! We also heard that Don and Paul made it from Makapuu to Kualoa, and much later Steve and Scrappy flew to Waiahole. Monday: Five First Timers to Two Golf Courses! The work week dawned a bit stronger and bit more decidedly east. But that didn't stop a record number of slackers, retirees and flextimers from hitting it hard on a Monday. Duck started things off, hiking up at 8:30 and texting me to wake up and join him. I rushed out with my coffee and hiked up to follow him. He was already across the bay in the strongest eastiest conditions ever. I didn't know how he'd managed that. I followed and barely punched over there on full bar. It was kind of amazing and kind of creepy to be over there in such strong east flow. After getting up over there I flew the slowest trip to Mokolii I've ever made. Although the return trip was pretty darn fast. By then we had reinforcements to join us for the downwind mission. We were hoping for more first timers to the golf course, and we weren't disappointed. Duck landed there for his first time ever, while Scot and I milked our glides out a bit further down the coast to the point. I'm pretty sure it was my most distant landing spot. Scot was a couple hundred yards farther and snagged the record. Though it wouldn't last long, as it turned out. Scot and I embarked on an epic hike out across Turtle Bay Golf Course to the resort, where Ginger and Duck picked us up, before we grabbed Joey, who had also landed at Kahuku Golf Course for his first time. Congrats to Joey and Duck! Don made it to Malaekahana, very nearly making the golf course. Brazilian Alex made it almost back to Kahana from Punaluu. As the first shift arrived back at Kahana, Mad Dog, Paul and Colorado Garrett were starting their downrange adventures. Duck and I chased them in the car, and we got to see Mad Dog smash the northbound site record with a landing at Turtle Bay Golf Course. Many of us have dreamt about that landing. It wasn't quite as dreamy as I'd imagined it though: Mad Dog had to descend through some nightmarishly strong and turbulent flow to get down. 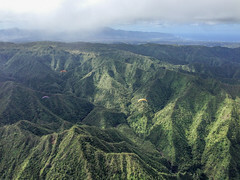 The other two flew just past Kahuku golf course on deeper inside lines, and picked out some creative and unique landing zones for themselves. Thanks to Ginger and Duck for retrieves. And special thanks to Nightshift for the duty free wee drams. What a prince! I made it to Pounders but then shot for Laie Pt. and then risked crossing over to an inglamorous landing right at Hukilau beach park. I could see the golf course, and it looked impossibly far. For most of the offshore glide from 3K+ at sacred falls I saw 400+ fpm sink so maybe the golf course would be attainable at a more normal 200 fpm down. I have a theory though: when an alien ship blazes down the same course first without losing any altitude then the Hawaiian God of Physics (F.MA) feels cheated and extracts retribution by demanding more sink tax from any followers. He apparently wasn't satisfied with my tithe and demanded more from McStalker a little later. Woe to any that dare follow Mad Dog's line - F.MA is waiting for you! New Award for 2014: The Green Jacket -- Awarded to the pilot with the most "planned" landings on distant fairways. Keep racking up those XC air miles! Sweet photos Alex in these stories. Cold Comfort. Nice title. I am sure our mainland readers are laughing at how whimpy we are when we say we are cold cruising in Hawaii at 3,000 ft. I was dressed for the occasion. Speaking of Golf Courses. Alex had never really given the etiquette for landing at the golf course seeing as he was the only one ever landing there. Now that we have totally invaded Kahuku and chipping up on to Turtle Bay there are a few things we need to know to keep it under the radar. 1) Wear a collared shirt and soft spikes. No, whoops that was for Mad Dog. 1) Seriously we have to land off the playing area which includes any where a ball can be struck. Fairways, immediate rough and sandtraps. 2)By all means do not ever land on a Green, which is the finely mowed grass with a hole and a flag. 3)The obvious stay out of water traps. 4) Try to land on the beach at Kahuku, Its huge and unobstructed. 5) Pack up and walk to club house avoid getting in the way of any golfers striking a ball in your direction. 6) Be quiet, no yelling and screaming of joy this disturbs the Golfers. Flying over them saying "Excuse me just playing through" or screaming out "Four!!" although quite funny may be considered rude and get us chased off the course. Ps. I said the first one and Reaper the second so it has happened. We were both so excited to land there. 7) Be polite to the course Marshall and maybe we should institute a gratuity to keep him happy. 8) When collection your golf ball trophy, make damn sure its not one that is in play, being used by a golfer approaching you. Do not make it obviouse that your looking for or picking up a ball. Golfers get really testie about you playing with there balls, even if it's not theirs. This is for Kahuku golf course which is a public course and not a high end course. Turtle Bay is a High end very well manicured tournament type course. Golfers may be paying well over $100.00 to play a round there and will not be happy to be interrupted even though we think its pretty damn cool. They absolutely will be furious with us landing there, I am guessing Mad Dog did not actually land on the course cause we did not have to bail him out. I think Alex & Mad Dog should work on some designated off the record LZ locations. Other than that. Wow, what a couple of days. I am sure we will be talking about this more often so before you head out for a round of golf make sure you know where and how to set down. It's Time to Fly Get Your Gear and Go!! We'll all meet at the 19th Hole.